Boston Globe Slowbituary: Doug Mohns Finally Gets His Due! For weeks now the hardreading staff has been imploring the Boston Globe to memorialize former Boston Bruins stalwart Doug Mohns, who died earlier this month. And – at last – the stately local broadsheet has. Sixty years after his rookie season as a 19-year-old with the Boston Bruins, Doug Mohns made a sentimental journey to the team’s annual fund-raising golf tournament last September. Although weakened by cancer, Mr. Mohns, who played half of his 22 seasons in the National Hockey League in Boston, walked into the dining room on his own at the International Golf Club in Bolton. 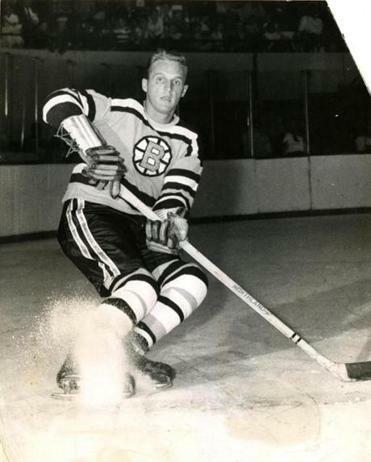 There he shared memories with Milt Schmidt, the Bruins coach in the late 1950s when Mr. Mohns played in two Stanley Cup finals, and he told everyone how special it had been to wear a Bruins uniform. Mr. Mohns, a seven-time NHL All-Star and the first Bruins defenseman to score 20 goals in a season, died of myelodysplastic syndrome Feb. 7 in the Sawtelle Family Hospice House in Reading. He was 80 and lived in Bedford. And finally got his long-overdue recognition from the Boston Globe. This entry was posted on Friday, February 21st, 2014 at 11:47 am and is filed under Uncategorized. You can follow any responses to this entry through the RSS 2.0 feed. You can leave a response, or trackback from your own site.